Dive into a salt water pool and relax to the sound of waves lapping on the rocks. “Tiny Almond Box” the pet name of the ancient palace of the Dukes of Loulé, is today, the prestigious Hotel Albatroz, a luxury hotel situated by the sea in the village of Cascais. This 19th century palace, designed by Ávila, the renowned architect, was constructed by the Duke of Loulé in 1873 and served as the private residence of several families until 1963, when it was converted into a guest house. In 1983, following extensive remodelling and amplification works, it was transformed into a modern and luxurious hotel in keeping with the charisma and refinement of its history, and the beauty of its architectural style. The sumptuous and elegant decor in soft colours effuses the charm of a private residence and reveals itself to be both comfortable and warm. The rooms and ample suites benefit from the calming view of the sea, also present at the restaurant and perfectly in harmony with the unique menu of fish and seafood. During the day, the proximity of the beaches and the marina offer the opportunity to practice countless water sports. In the evening, be sure to explore the vibrant village of Cascais as a complement to an unforgettable stay. - Welcome decanter with Port wine replenished daily. 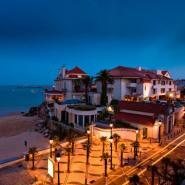 Hotel Albatroz is located in the Village of Cascais next to the Conceição beach. Taking the A5 high, from Lisbon heading towards Cascais, exit at the end of the highway, drive through the village of Cascais following the direction of the centre and the train station. An alternative is to exit the A5 onto the Marginal and to drive alongside the sea towards the centre of the village of Cascais and the train station. "It was the best. The pools, food, service, rooms, everything was first class. When we asked for suggestions on places to eat - we would arrive at the restaurant and find that they made reservations for us. When we asked direction, they always drew a map and ensured that we had everything we needed - even checked their websites to ensure they would be open."